Inspired by Debussy’s 150th birthday anniversary Tomorrow, every morning at 8:30, we’ll play a composition by Debussy inspired by some specific place. Today, it’s a piece titled Danse and subtitled Styrian Tarantella. It was written in 1890 after Debussy returned from Villa Medici, Italy, where he had spent two years studying as part of winning the the Prix de Rome in 1883. Styria was also the birthplace of Johann Puch, founder of the company Steier-Puch, famous for its motorcycles, trucks, and rugged little off-road vehicles that these days we call ATV’s. A posed portrait of today’s featured performers from the BBC Proms. Celebrating the centenary of our most irreverent experimenter John Cage, expect cassette players and plucked cactuses. Thursday, 3 p.m. hour: Regional Spotlight: Pianist Yulianna Avdeeva plays Bach. Friday, 8 p.m.: The Mozart Festival, Part 3. Sunday, 6 a.m.: Pipedreams: Revisiting England. Sunday, 1 p.m.: SymphonyCast: From this year’s BBC Proms: Sir Mark Elder conducts the Aldeburgh World Orchestra. Monday, 7 p.m.: Roll Credits. Tuesday, 8 p.m.: Debussy: Pelléas et Mélisande. In one week, I leave for a month-long sabbatical to hike the John Muir Trail in California. No iPod traveling with me, so I’ll have classical radio in my head as I walk 222 miles through that sublime terrain. I’d love to know your playlist for a solo hike. Great suggestions thus far on our SymphonyCast FB page with an emphasis on Beethoven and a Marin County, California composer who likely has walked some of the trail! 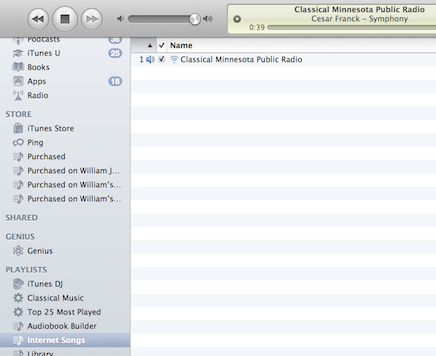 There are many great ways to listen to Classical MPR, and one of them is to stream it in iTunes. Our listing has temporarily dropped out of the “Radio” listings, so here’s a tutorial to add it — and our choral stream — manually. You know how to copy and paste by right clicking and/or using keyboard shortcuts (Ctrl-C for copy and Ctrl-V for paste, in case you were unsure — replace Ctrl with Cmd if on a mac). You love and want to listen to classical music! Start by copying one of the links listed below. Open iTunes, and click on the Advanced menu and then the Open Stream menu item. You can also hit Ctrl-U, or Cmd-U on a mac, to do the same thing. You should get a box which is asking for a URL. Paste into it the link which you copied earlier. Click OK. The stream should show up in a new playlist called Internet Songs (lousy name, more on that later), and start playing. 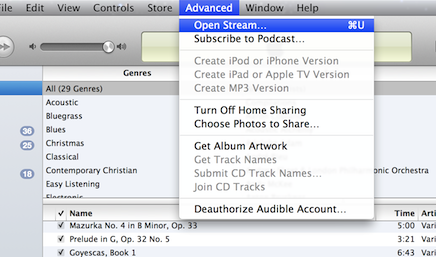 If you want to listen to both of the classical streams, just repeat the process to add the second stream to iTunes. If you want to listen to both streams at the same time, listen to John Cage’s Imaginary Landscape No. 4, take two aspirin, and lay down for half an hour. 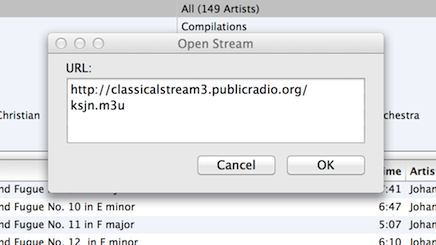 Now whenever you want to listen to Classical MPR, just go to the Internet Songs playlist and double click on the stream. 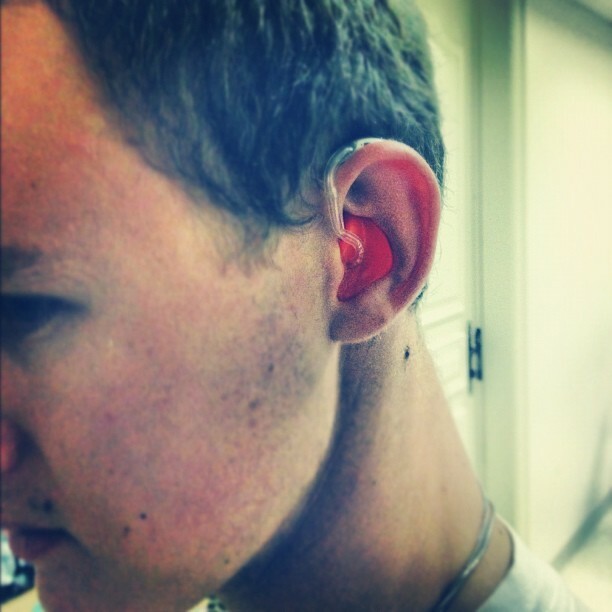 Voilà, you have music. It’s CD giveaway time and this week it’s a marvelous new disc by Milos Karadaglic. Milos says that it was a vintage video of Andres Segovia playing Manuel Ponce that had the biggest impact on his future career. The steamy atmosphere is only enhanced by the stoked fire smoldering over his shoulder. An interesting convergence of tech and music. Researchers at Tokyo Metropolitan University have built a set of scanners which can convert the printed score into computer generated sound in real time.